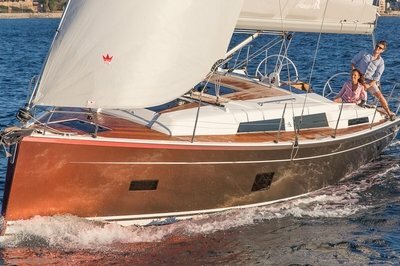 With excellent performance, a good cockpit layout and suitable extras, the Cruisers Yachts 430 Sports Coupe is a good competitor in the 40-something-foot yacht market. Its equipment largely parallels that of other vessels in that group, but with some interesting differences. It manages a very respectable speed, economy and handling profile, while offering many of the options found in other boats of this size as standard equipment. One option, dynamic positioning, has long been a staple in offshore oilfield operations. When you stop your boat, the DP system’s computer uses a GPS interface and your boat’s thrusters to keep your boat within a few yards of the location. It’s as if you parked it and it will remain parked there for as long as you please, without anchoring. With a 43-foot length overall and a 13.5 foot beam, the 430 Sports Coupe weighs in a 22,000 pounds before you add people, baggage, supplies and fuel. It can carry up to 300 gallons of fuel. The 430 Sport Coupe has both gas and diesel engine options. You can choose from Mercruiser’s 425-horse 8.2L gas with a V-drive, or Volvo’s 400-horsepower gas engines with IPS 550 pods. The available diesels are two versions of Volvo’s D6: a 370-horsepower model with Volvo IPS500 pods or the 435-horsepower D6 with IPS600 pods. Cruise control and dynamic positioning are available with the diesel engines only. In a live test using the 370-horse Volvo, the 430 Sports Coupe reached 32 knots at full throttle (3,550 rpm), while consuming 41 gph. That equates to 0.9 mpg and a total range of about 240 miles. At a more conservative 3,000 rpm, you move along at a respectable 24 knots while achieving a little over 1 mile per gallon with a range of about 305 miles. In spite of its 6-foot, five-inch headroom in its interior, it has a low exterior profile. In the 430 Sport Coupe’s standard configuration, you’ll slide under bridges without incident, as long as you have at least 11 feet, 6 inches of clearance between the water’s surface and the bottom of the bridge’s lowest structures. 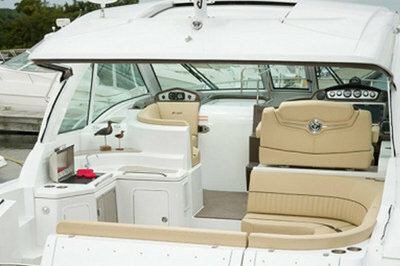 The captain’s chair on the 430 Sports Coupe has a double seat with a flip up bolster at the command position. You’re two steps above the aft cockpit, facing a sports wheel, with the dual throttles at your right hand. The molded control console comes with full engine instrumentation, plus a Raymarine E127 multifunction display that includes a GPS receiver, a digital chartplotter and digital sonar. A full 360-degree view comes with the captain’s chair, along with a set of HVAC vents on both sides of the helm to ensure your tour at the wheel remains comfortable. The roof that covers the glass-enclosed helm and cockpit has a full-length sunroof that floods the cockpit with light. The center of the windshield opens completely to allow access between the cockpit and the foredeck. The optional instrument packages include a 4kilowatt radar with an integrated autopilot, a pricey option at $21,185 for the Mercruiser and V-drive, or at $23,660 for the IPS drive. You can add a VHF radio to either package for $810, or purchase and install a VHF marine radio yourself for much less. If you wish to heave to and remain in an exact position, within 0.002 degree of latitude and longitude – without anchoring — or move precisely into otherwise intensely tight docking spaces, turn on the optional dynamic positioning system located at the helm. A lounge seat that’s just a few feet to the left of the command chair has a stereo and MP3 port close at hand so you can take your music with you. 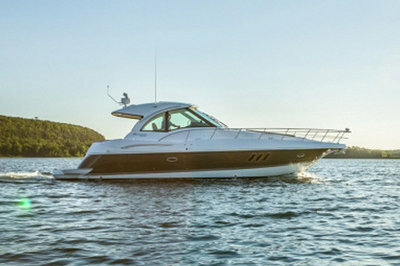 The 430 Sports Coupe is quiet enough that conversation between the helm and the lounge seat is possible. The climate-controlled cockpit features a wet bar with sink, a 20-inch LCD TV and lounge seating along the sides of the cockpit as standard equipment. An optional gas grill and refrigerator complete the above-decks entertainment area, and because the cockpit extends over the engine room, you’ll find the electrically operated engine room hatch in the middle of the cockpit deck. Go below decks and the first things you’ll notice are the 7-foot, 3-inch overhead and a built-in liquor locker at the bottom of the steps, to serve the wet bar in the cockpit. The salon features a leather-covered, crescent-shaped dining area that comfortably seats three and, in a pinch, can seat more. The dining area and galley are flooded with light from vertically aligned port holes on the sides of the boat and skylights in the deck above. Across from the dining area, the galley is equipped with a two-burner electric stove, wine storage, and a microwave-convection oven. There’s ample storage for provisions and what not, as well as faux granite countertops. At the forward end of the settee and the galley, the master suite is separated from the salon by only a privacy curtain. Quarters aboard the 430 Sports Coupe include the master cabin, with a forward ventilation hatch that includes both a screen and translucent panel that admits light. 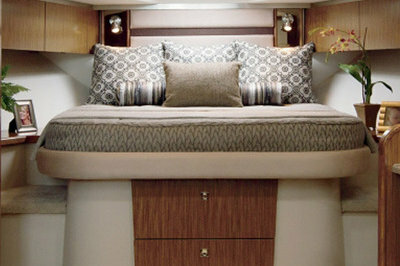 The master cabin includes cedar-lined storage lockers on both sides of the queen-size island-type berth, and additional drawer-storage beneath the bed. The primary head is on the port side, aft of the dining area, and features a large, full-height shower. Oddly, the master cabin lacks a private, en-suite head, shower or vanity, while the guest cabin, on the starboard side, aft of the galley, has hanging storage and its own vanity and toilet, but no shower. The guest cabin has a double berth that you can convert to a queen-size berth. •	The base model Cruisers Yachts 430 Sports Coupe costs between $757,680 and $803,690, depending on the engines, drives and other options selected, meaning a well-equipped 430 Sports Coupe costs between $834,855 and $890,545. •	The visibility from the helm is excellent. 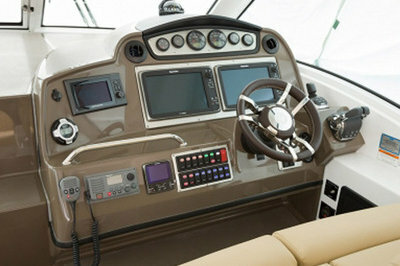 •	The standard 430 Sports Coupe doesn’t include a VHF marine radio or radar. 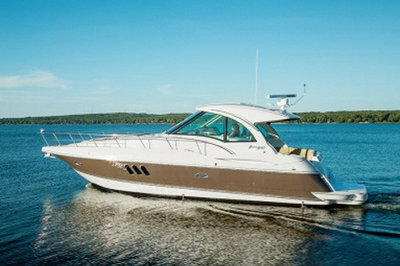 •	The 430 Sports Coupe is surprisingly economical at the very reasonable cruising speed of 28 knots. •	The guest cabin, located amidships, has a head and vanity. •	The cabin and cockpit are arrange so as to prevent, or at least delay, the boat’s catastrophic downflooding in the event of marine disaster. The Cruisers Yachts 430 Sports Coupe fits well into the 42- to 45-foot yacht group, in spite of its master quarters’ lack of a separate, exclusive head and shower. It’s one of the less expensive, primarily because of its a la carte options list. Its fit and finish are in line with its base price and the DP system makes heaving to and, more importantly, docking in a space with 6 inches clearance fore and aft, a perfectionist’s dream. The question is, as always, one of trade-offs and individual taste.